Its been an under the weather week in this house. I don’t know about you, but after spending too many days housebound with the dreaded lurgy I feel like burning all pajamas and bedding associated with the illness. I may have read too many plague books. Luckily that urge isn’t strong enough to act on, it just tends to lead to a lot of washing in hot water. My illness was in the throat, so I was off my tucker for a bit. Horrifying I know. Instead of thinking of all the tasty creations I could make for dinner I turned my thoughts to what my giant tonsils would let pass them with the least amount of pain. I tried soup. No. Heat = pain. Also, my lovely husband, who was learning how to make soup in the Thermomix while looking after a sick wife and children, thought it was a good idea to throw in a chilli. In normal circumstances that would be fine with me. In this case, no. Heat two ways = lots of pain. Next I tried sorbet. Yes. Ice worked much better. An added bonus was using up some fruit from our ever abundant fruit bowl. I did pink grapefruit. Some vitamin C there. I ate some shortly after I made it, then put the rest in icicle containers so I could access some icy soothing as many times as I needed. Then I figured I should go for something that had a bit more oomph in the nutrition, or at least ingredients quarters. 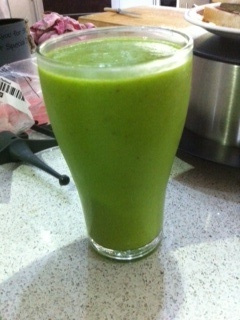 I had read about green smoothies on several Thermomix sites. Like so many things in the Thermomix world, I had not encountered them in my previous life. Now, suddenly, they are everywhere. I might be moving in slightly different circles nowadays because Green Smoothie was a menu item at a cafe I visited last week. I hadn’t been moved to try them before, because, well, frankly they sounded gross. I think the smoothie bit isn’t helping. There isn’t a dairy component in most of the recipes I have read. Its more of a juice. And, to my great surprise they taste great. As I often do when faced with unfamiliar things I turned to Quirky Jo. She has some very good green juice recipes. 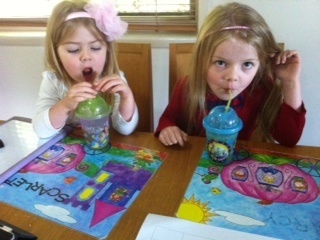 I tried the Shrek Juice for the kids (cup of ice, peeled orange x 3, handful of spinach leaves). They actually like it! Look! For a grown up version, I went with Jo’s Favourite Green Smoothie, which is a frozen banana or two, snapped into thirds and thrown in, 2 apples in quarters (I did core, though Jo suggested you don’t need to), 1 peeled lime, 2 cups of ice (or a few more cubes – I wanted it icy cold to numb the tonsils), 300g water and a torn up smallish bunch of washed kale. You could use spinach, or even lettuce instead. I had bought some kale and wasn’t sure what to do with it. Muttering Housewife hadn’t said nice things about it, in fact, compared its taste to horse blankets, so I was a bit scared. It had started looking a bit sad and soggy in the fridge so I thought I should chuck it into this juice mix before it went too far. Mix all this up on Speed 10 for 2 minutes for a completely smooth texture. It makes a good amount, enough for 4 serves. I managed to finish a schooner of it and I couldn’t taste any horse blankets. It wasn’t too sweet, but flavoursome. More a fruit juice taste than a vegetable juice taste. The banana gave it a creamy texture, so I suppose smoothie could be used to describe it. I still prefer to call it juice. And I will call it that when I make it every time I have any greens on hand. It is a great breakfast option as it has a great nutrition boost and good for iron absorption with leafy greens and vitamin C. Also quite a good afternoon pick me up. I realise there may be friends who knew me in my 20s who may wonder what has happened to me.